All second round tax-sale auctions for 2018 will be conducted entirely online unless otherwise noted. These sales will still be subject to our Standard Rules. However, some procedures have changed. Please review the information on this page to ensure that you understand these new procedures before bidding. There will be no live online or in person bidding. All bids must be placed in advance through our website. Best and Final maximum bids must be placed by 11:59 pm on Friday November, 2nd, 2018. Winning bids will be calculated and awarded at 12:00 pm on Monday November, 5th, 2018. Lots may sell for less than the maximum bid that you entered depending upon the level of competition. Tie bids will be awarded to the bid which was placed earliest. Winning bidders will be contacted via email and will have 5 days to submit payment and other documentation. $30 deed recording fee, 10% buyer's premium, and current real property taxes will be added to the winning bid amount. All second round auctions will be conducted entirely online. There will be no live bidding. Instead, all bids must be submitted ahead of time by 11:59 pm on Friday November, 2nd, 2018. Once all bids are received, the winning bid price will be calculated and awarded at 12:00 pm on Monday November, 5th, 2018. This sale process requires that you enter your best and final bid price prior to the cutoff date. It is important to understand that while you are submitting a maximum bid, you may win the lot for less depending upon the level of competition. Bids are calculated on a next-highest-increment basis, using the same bid increments we have had at our sales for many years. Bidder 1 submits a bid at $1000. Bidder 2 submits a bid at $8000. WINNER: Bidder 2 at $1800, which is one bid increment ($100) higher than the second highest bid. In this case, Bidder 2 won the property for less than their maximum bid of $8,000 because the next highest bid was only $1,700. If two or more bidders submit identical maxmimum bids, the tie will be awarded to the bid that was placed first. WINNER: Bidder 1 at $1000 because their bid was entered before bidders 2 and 3 entered their identical bids. Wining bidders will be notified via email and will be provided additional information about payment and necessary paper work. Do not bid more than you can afford to pay. You should place bids assuming that you may win all of the parcels you are bidding on and at your maximum bid for each. If you can't afford to pay if that happens, you should adjust your bids accordingly or remove one or more lots from your bid list. Seller reserves the right to require an additional cash surety prior to the time that winning bids are awarded to ensure bidder's ability to pay. In order to place an advanced bid at our second round sale you must fist create a free online user account. You can sign up here. It's fast, easy, and free. After you have an account, you must get Authorized for online bidding. In order to authorize you for online bidding, we will place a $1,000 hold on your Visa, MasterCard or Discover credit card. This hold is NOT A CHARGE but WILL count against your available credit limit until it is released by your credit card company. Authorizations are generally valid for 30 days. This $1,000 hold serves as a security deposit which will only be collected against if you are a winning bidder and fail to pay for your purchase. Simply click where it says "Click here to get pre-authorized" and follow the instructions to enter your credit card information. Once the hold is placed on your card, you will be authorized for online bidding for a period of 30 days. If you do not have a credit or debit card, please call our office at 1-800-259-7470. Once authorized, placing a bid is easy. Simply visit the lot description page for the lot upon which you want to place a bid. Then, scroll down the page until you see the "Place Bid" section. Enter your desired maximum bid amount and then click "Place Bid." Remember, you are entereing a maximum bid. The lot in question may sell for less than your max bid depending upon the level of competition. Modifying your bids is also very simple. Go to the same section of the lot description page where you placed your bid. To modify your bid, simply enter the desired bid amount in the box and click "Modify Bid." To delete a bid you have already entered, simply click on "delete bid" in the table which lists your current bid information. 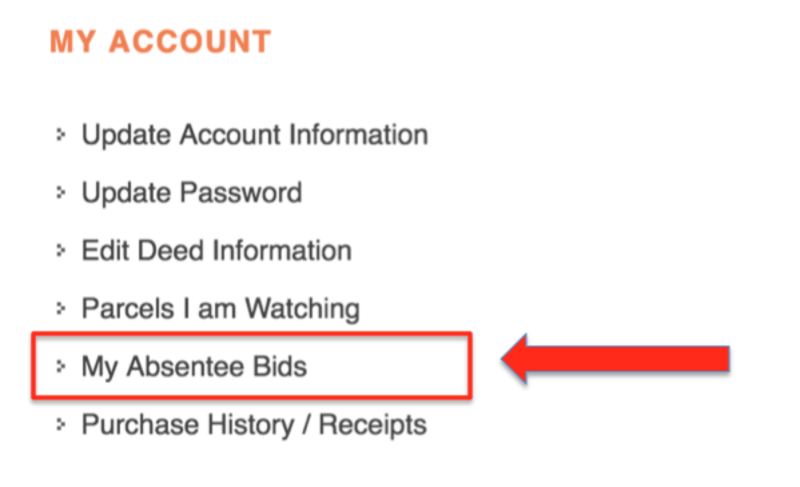 You can view a full list of the bids you have placed by clicking on "My Absentee Bids" from the list on the upper right-hand corner of your account page.